Last Christmas my grandmother gave my niece a play kitchen and she fell in love with it immediately. 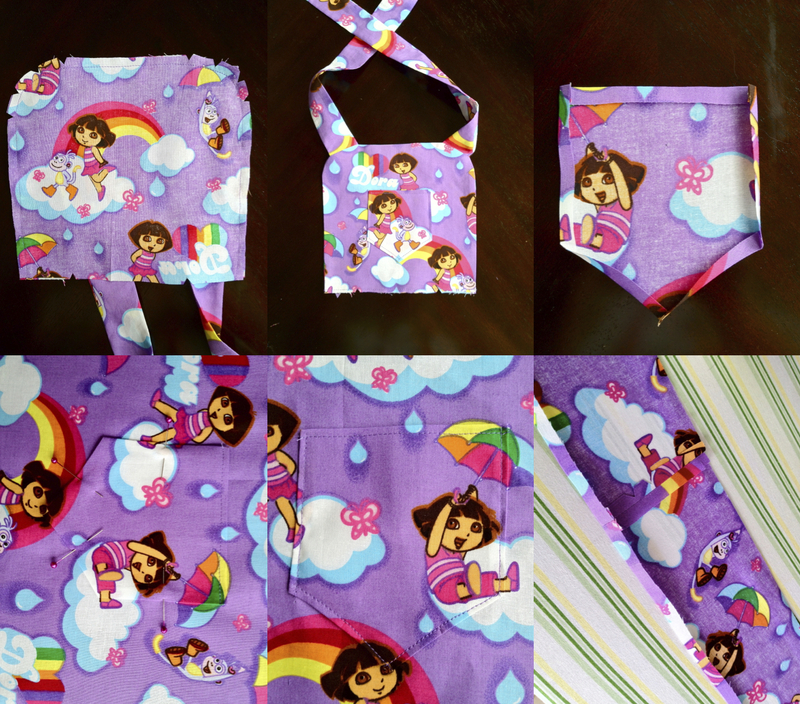 She’s obsessed with Dora the explorer so for Christmas this year I wanted to make her an apron she could use when she played in her kitchen. 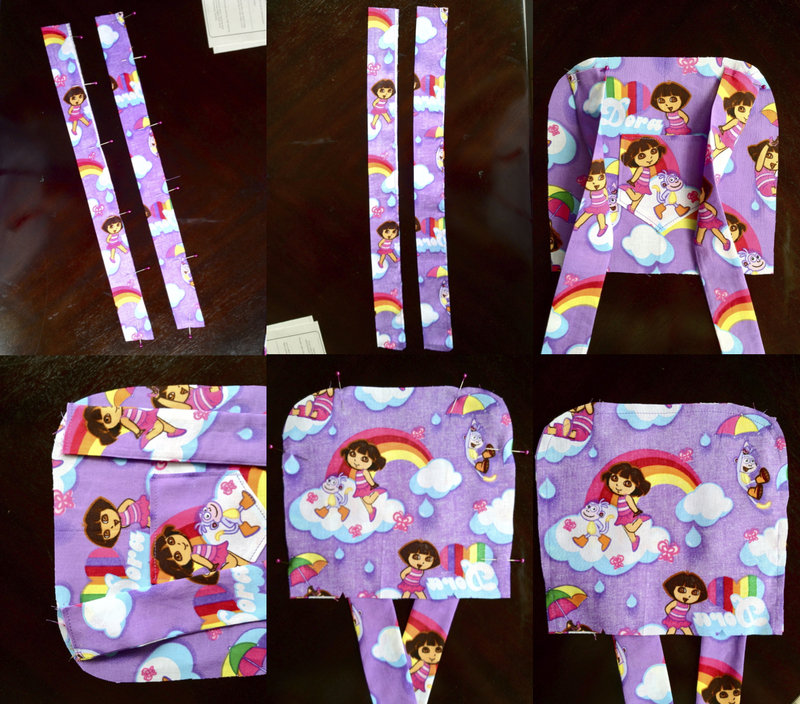 I really lucked out and found this fabric in the remnants bin at Wal Mart… it was a full yard and cost me $1.50. The pattern I used is Simplicity’s 2295, view A in the small size (she wear’s a 4T). I loved the playfulness of the pattern, I think the ruffle along the bottom is adorable and I love the two pockets. I ended up taking a ton of pictures while I sewed this so I will share those. 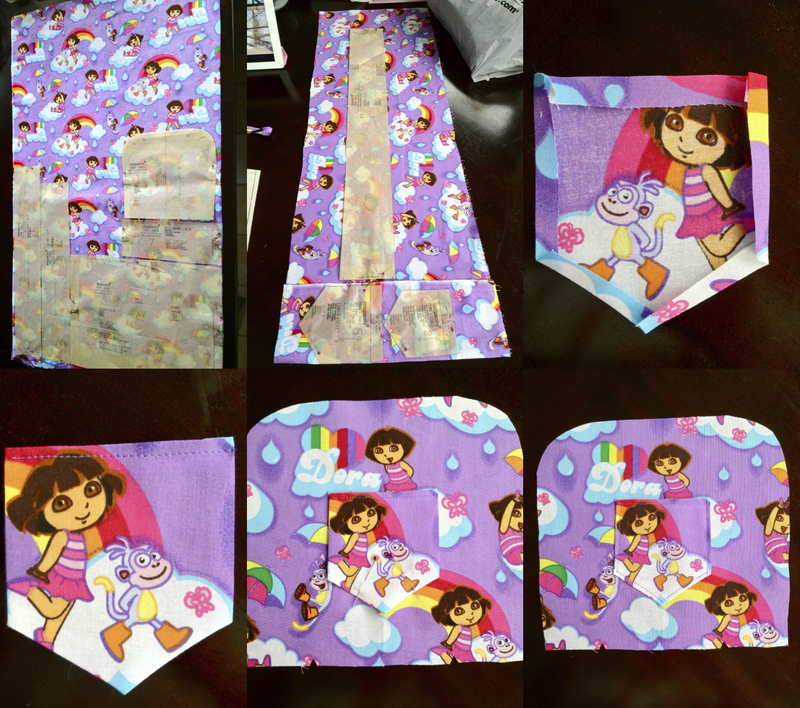 I cut the fabric as instructed in the directions, but with the big print of my fabric the pocket looked silly once sewed on. After I finished the apron I went back and fixed the pocket on the top. I took the original one off and recut a new one that would match up perfectly with the bib so it looked like one piece of fabric. 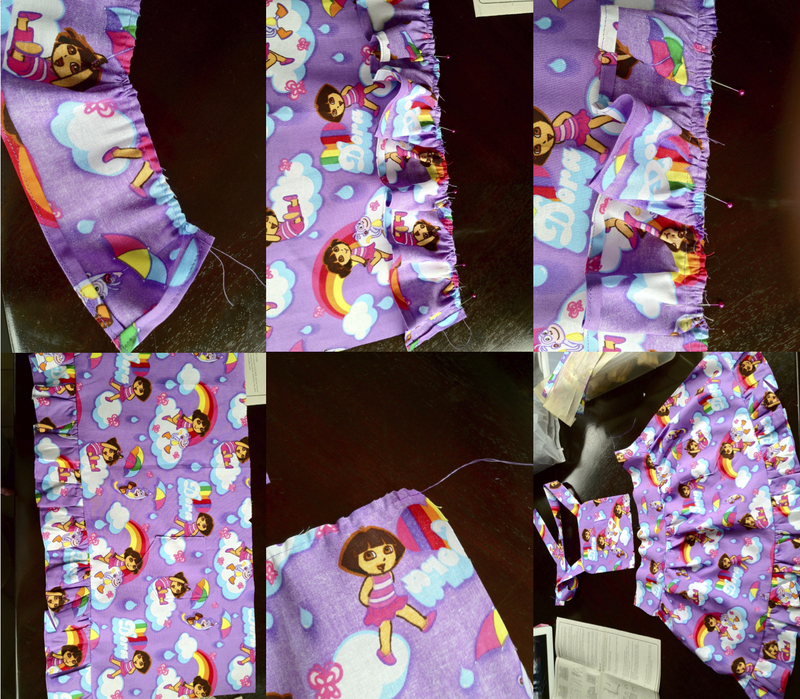 As you can see in the set of pictures above, I learned my lesson from the first pocket and fussy cut the pocket for the skirt of the apron. It matched up perfectly with the print on the fabric of the skirt to keep it looking like one piece of fabric. 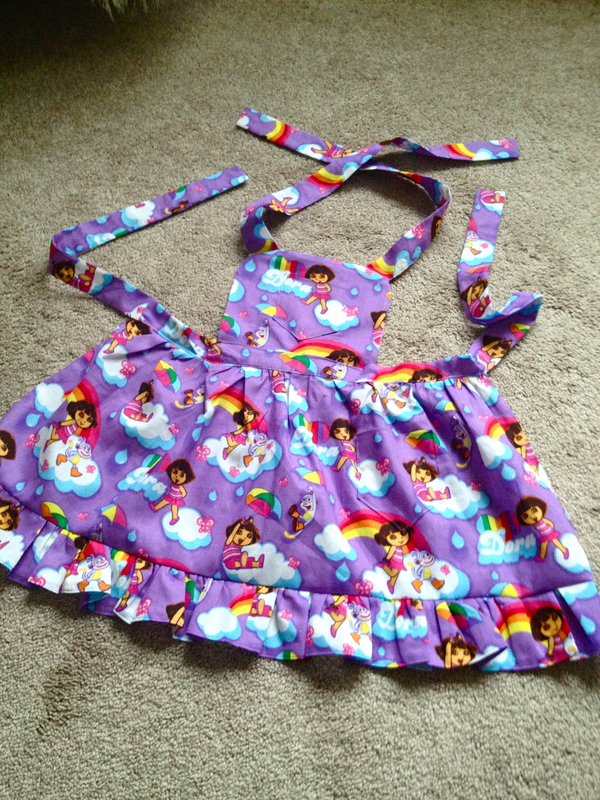 The pattern called for two different fabrics, one for the body of the apron and a contrast fabric for the ruffles and pocket but I really liked how this apron turned out using just one fabric. Aside from having to fussy cut the pockets, I just followed the instructions that came with the pattern! Thank you for posting! I’m a newbie helping my daughter and the lingo in the instructions was confusing! You’re welcome, Tyerice. I’m happy that you found this helpful!